Potentilla fruticosa 'Marob' "Marion Red Robin'' ™ Pride of Place Plants Inc.
Potentilla fruticosa 'Marob' "Marion Red Robin'' t.m. PBR 0130 U.S.P.P. # 9321 was introduced to North America by our company 8 years ago. The cultivar was bred and is owned by Mr. Laddie deJong of Ireland. Mr. Adrian Bloom of Blooms of Bressingham (the agent for Potentilla' Red Ace' ) and I had discussed the potential of this plant for some time before it was decided to release it to the trade. The cultivar is smaller, and redder for longer than ' Red Ace ' at both ends of the growing season. The tendency is that' Red Ace' fades in summer from red to yellow while' Red Robin' fades from red to orange. 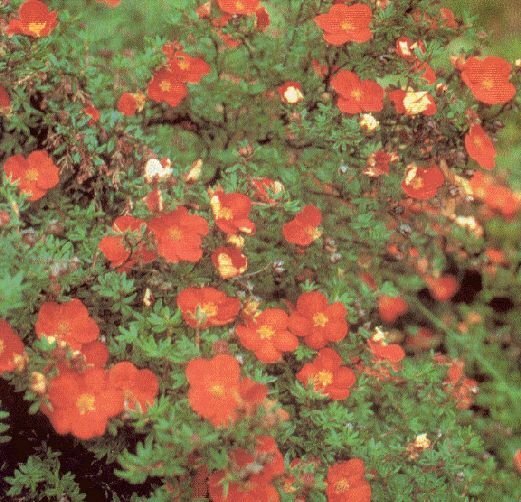 It is interesting to recognize that recent research done on the Canadian prairies has identified the gene within coloured Potentilla cultivars that triggers the colour change by day lengths and heat. Our company owns the Plant Breeders Rights in Canada and Hines Nurseries Ltd., California owns the Plant Patent in the U.S.A.
Potentilla fruticosa 'Floppy Disk' was introduced by Mr. Peter Catt of Liss Forest Nurseries , the breeder of many plant cultivars. Peter is probably best known for the introduction of Choisya ternata "Sundance", a golden sport of Choisya ternata. Liss Forest nursery managed by Peter and Vincent Catt is recognized internationally by the trade as one of the finest production nurseries operated by the best Horticulturalists in Europe. Potentilla fruticosa'Orangeade' is a Canadian introduction from the Potentilla breeding program at the University of Manitoba and the Federal Research Station at Morden Manitoba. It is the first cultivar released with concentration to the specifics of color stabilization by gene manipulation. West-Wind Nurseries & Landscaping Ltd.